New to Solos, our sun-kissed beach holiday to Bodrum is destined to be a summer sell-out! Glistening beaches, whitewashed houses, historical sights and a huge selection of restaurants and bars make this Turkish treasure the perfect seaside getaway. Nestled in a peninsular on Turkey’s Western coast, Bodrum is a beautiful vacation spot. Our hotel’s location couldn’t be more perfect; overlooking the sparkling bay and with a private Blue Flag beach right on your doorstep, you’ll find that the sea and sand is never too far away! Take a dip in the giant lagoon-style pool, sip a cocktail at one of the hotel’s three bars, take a stroll along the sandy beach or simply find a sun-lounger and soak up the gorgeous Mediterranean sunshine. If one beach isn’t enough, Bardakci Beach is also just a short walk away. The town’s main tourist beach is lined with restaurants and bars selling everything from fresh seafood to traditional Turkish meze. This charming coastal town is a perfect example of traditional and modern life working in perfect harmony. If you fancy a break from the beach, head into Bodrum town to explore the historical sights. Bodrum Castle is a must-see; this medieval fortress dates back to the fourth century BC and was partly built with stones from the Mausoleum at Halicarnassus - one of the Seven Wonders of the Ancient World! There are also plenty of markets and bazaars that fill the town, selling fresh fruit and vegetables, local cuisine and textiles. And when evening comes, why not treat yourself to some drinks in one of the trendy bars or restaurants that line the waterfront promenade? The town is just over 1km away and easily accessible by water taxi from the beach or the local dolmus. If you fancy a more active day out, why not join us on some of the optional excursions available on this holiday? With boat trips, market tours, village visits, buggy safaris, trips to surrounding Turkish cities and towns and so much more on offer, your holiday can be as action-packed or as relaxed as you like! There are a host of facilities here where we can be busy or relaxed without having to move. Food and drinks are taken care of at the 2 on site restaurants, 1 buffet and 1 a la carte; 3 bars, including a beach bar and pool bar; and patisserie serving delicious sweet treats while the sunbathing can be taken on the beach or around the large pool. The spa features an indoor pool, Turkish bath, gym, sauna, steam room and Jacuzzi, beauty treatments and massages (additional charges apply). The rooms are of classic Turkish décor all with air-conditioning, satellite TV, safe, hairdryer, free Wi-Fi, minibar, balcony or terrace. Sea view room supplement, please call. Due to the number of steps around the property and its location on a hill we would not recommend this holiday for guests with walking difficulties. 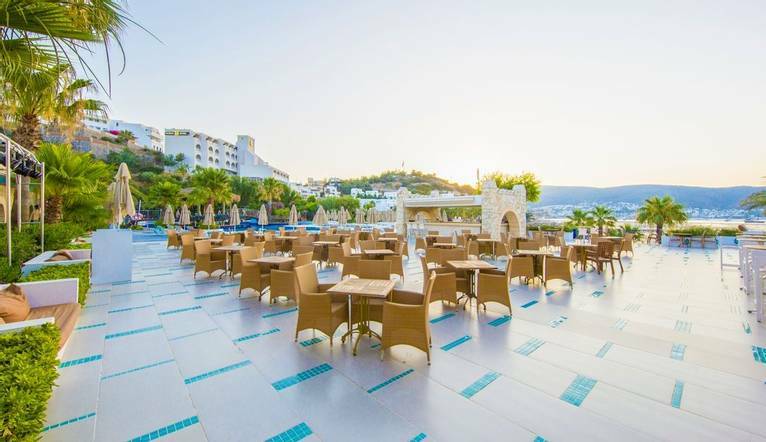 Transfer time from Bodrum airport to Salmakis Resort & Spa is approximately 40 minutes. You may wish to take an optional excursion during the course of your stay. Full details will be given at the Information Meeting. All tours can be paid for in sterling currency and preferably in cash only. Your Tour Leader will help arrange these for you but may not necessarily accompany you. Your Tour Leader will be on hand to offer advice or suggestions if required but gratuities are offered entirely at the sole discretion of the individual. We suggest a group collection to cover drivers, porters and hotel staff of €15.00 per week. Your Tour Leader will collect this on your behalf and distribute it accordingly, thus relieving you of the burden of who, when and how much to tip. The tipping of housekeeping will be left to your individual discretion (a small amount left in your room on departure should cover this and would be much appreciated). As is customary, ‘the hat’ will be passed around for the driver and guide on all optional excursions. For any meals that are not included in your itinerary, or taxi fares, your Tour Leader can advise of an appropriate add on. Casual, cotton, lightweight daytime wear is the order of the day. Comfortable shoes are a must for sightseeing. Smart casual clothes will be ideal for the evening, with the emphasis throughout being informal but with no shorts or vests in the restaurants in the evenings. Early and late season evenings can be cool so do ensure that you take a cardigan or jacket and even some rainwear.